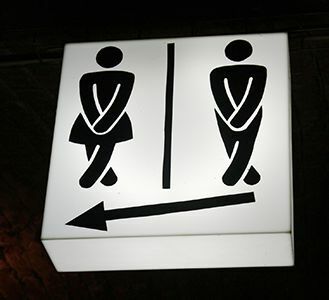 Reality Check: Do You Have an Overactive Bladder? If any of these describe you, talk to your doctor about your Overactive Bladder symptoms. OAB is generally caused by bladder muscles that are overly sensitive or overactive. This overactivity is caused by damage to nervous system or to the nerves and muscles associated with bladder. While the cause of the nerve damage is often unidentified, it can result from Multiple Sclerosis, Parkinsons's Disease, Alzheimer's Disease, stroke or injury. The Overactive Bladder symptoms of urinary urgency, urinary frequency or urge incontinence may also be present in people with interstitial cystitis or post-radical prostatectomy. First, you will need to be evaluated for Overactive Bladder. Your doctor may take your medical history, test your bladder function and ask you to record your bathroom habits and accidents in a voiding diary. If you receive an OAB diagnosis, your doctor will work with you on a personal treatment plan. Therapy typically begins with modifying behaviors (e.g., watching fluid intake), doing pelvic floor exercises and drugs. If these treatments don’t work, your doctor may offer Urgent PC, a low-risk, out-patient treatment proven to work in up to 80% of patients. Surgical interventions may also be used. 1. Stewart, W.F., Rooyen, J.B.V., Cundiff, G.W., Abrams, P., Herzog, A.R., Corey, R., et al. (2003). Prevalence and burden of overactive bladder in the United States. World J Urol, 20, 327-336.